In-App Purchase and Mobile Services. You should verify your receipts on the server and not trust the client (it's extremely easy to cheat if you do). Ideally, the enforcement of your subscription should also occur on the server, because we never trust the client. ... I thought it would be fun to explore how easy it would be to implement this with Windows Azure Mobile Services. Note - this is not a tutorial on In-App Purchase. Manton mentioned that he would blog the content from his presentation in which case I'll link to this from here. In the meantime - here are the apple docs which are pretty thorough. To demonstrate the idea, we're going to take the Mobile Services quickstart and make it subscription based. That is, in order to use the app you must pay a weekly fee otherwise the server will deny access. This will be validated and enforced on the server and associated with a particular user. So if I login to another iOS device and have already paid my subscription - the server will automatically let me use the service based on who I am. Since we're handling users, we need to add login to our application - to save me from boring you with this code here, check out our easy to follow authentication tutorial or watch Brent's 10 minute video: Authenticating users with iOS and Mobile Services. This is straightforward since reading data from Mobile Services is extremely easy. 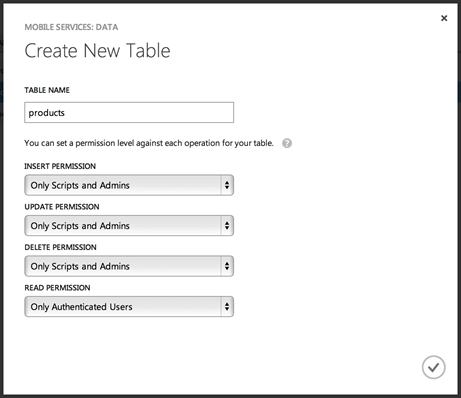 I created a new table 'products' and set all permissions except READ to 'Only Script and Admins' (private). READ I set to Only Authenticated Users because they shouldn't be buying stuff without logging in, that's a requirement of my example (but not all, others may choose to make this data completely public). In this case, we'll have the client pass the transaction receipt to the receipts table. But then we'll fire this to the App Store to check if it's valid. If it is, we'll receive a detailed response from Apple with contents of the receipt. This is the data we'll insert into the receipts table, along with the current user's userId. This really isn't intended to be a full tutorial on In-App purchase and we don't cover a number of topics including restoration of purchases and more, however, hopefully this post has shown how you can leverage Mobile Services to provide a comprehensive In-App Purchase Server and protect your services from customers that haven't paid.